Brampton Community Garden in Cumbria are looking for more volunteers. If you have been toying with the idea growing your own fruit and vegetables but have been put off by the amount of work involved or you simply don’t have the space, then a Community Garden could be just the thing. It is what it sounds like, a garden for everyone in the community – a chance to join in with vegetable and fruit growing activities, to learn skills and socialise as you work, and to enjoy eating a share of the fresh produce. Anyone can be a part of it – you certainly don’t need to be an expert. There are community gardens all over the country and the one in Brampton started last year when Jon Pickering at Millfield House heard that the Brampton Food Network was looking for a possible site. He offered, for five years initially, a piece of land that was previously used as a pony paddock. It’s just over half an acre located between Murray Park and Lovers Lane, near The Sands. 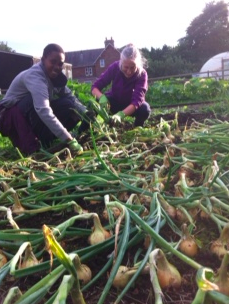 The soil is in good heart and volunteers grew some excellent veg last summer in spite of a late start to the season. Some excellent food was produced. The potatoes, squashes, peas, beans and onions were especially successful and the chard, cabbage and kale kept them going in greens through the winter. A small amount of produce was sold at The Cottage on Wednesday mornings and the members hope to increase this in the coming season. Various fruits are gradually being established; gooseberry, blackcurrant and redcurrant bushes; raspberry canes along the south-facing wall; a strawberry bed; several crowns of rhubarb. The herb bed is flourishing and it added welcome splashes of colour to the garden last summer, with marigolds, nasturtiums, feverfew, borage, rosemary and lavender. Towards the end of last summer the large polytunnel in the garden was completed with the help of grants from Cumbria County Council and Brampton Food Network. Plus a lot of hard work from volunteers! A bark path was laid down the centre and the beds either side were dug and then covered with weed-block. 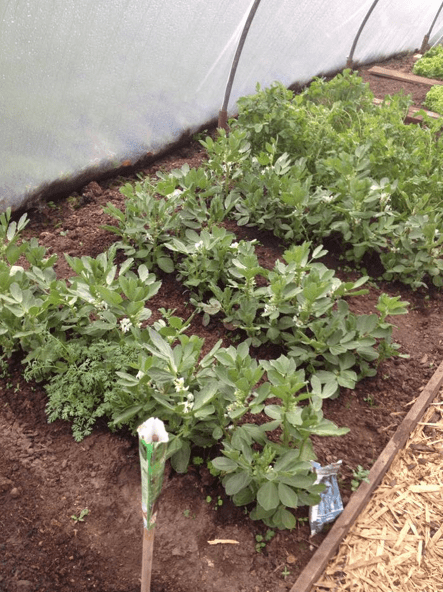 Although it was late in the season a few things were planted in the autumn, so they are expecting a few early potatoes, strawberries and broad beans as well as salad crops. This year they are looking forward to growing plenty of tomatoes, cucumbers etc. Garden volunteers can be found at Lovers Lane every Saturday afternoon between 2pm and 4pm and would be pleased to see you if you’d like to have a look round. Of course, if you’d like to join in they will be delighted to find a job for you! To make a commitment and become a member it costs only £10 for the year which helps towards the cost of seeds and tools. If you would like to visit the garden, join in as a member, or maybe donate tools or plants to the project please contact one of the following people.